Students using the textbook and Study Partner CD will:Learn about pharmacy laws and regulationsStrengthen pharmacy calculation skills with a new practice testUnderstand sterile and nonsterile compounding regulations and proceduresReview and expand knowledge of the commonly prescribed pharmaceuticalsUnderstand infection control and requirements for handling disposal of pharmaceutical and hazardous wastesKnow up-to-date information on billing, reimbursement, and healthcare reformGain essential knowledge of professional standards, electronic medical records, e-prescribing, new technologies, and information managementLearn about pharmacy ordering and receiving, management of outdated and recalled pharmaceuticals, and quality-assurance procedures in pharmacy settingsReview medication errors and gain prevention strategiesEach textbook includes a Study Partner CD! Practice TestsPractice tests provide students with an opportunity to gauge their knowledge, identify areas for additional study, and hone their test-taking skills. This edition includes:A 90-question pretest at the end of Chapter 1 that allows students to assess current knowledge and identify areas for additional studyNEW! A 50-question calculations test that includes problems on weights and measures, dosage, dilution, alligation, mark-up, Drug Enforcement Administration (DEA) verification, and moreNEW! 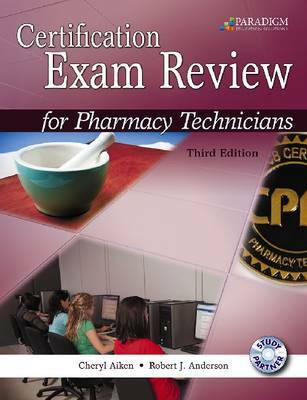 A 25-question pharmacology test that covers brand and generic drugs, adverse reactions and drug interactions, auxiliary labeling, over-the-counter medications, and dietary supplementsChapter FeaturesLearning Objectives establish clear goals for students as they begin their chapter study, helping them focus on the information that is most critical to their success.Tables highlight important information related to the chapter topics and serve as a study aid.Figures provide students with additional detail and visual reinforcement of chapter topics.Skills Quiz questions at the end of every chapter focus student review on key concepts included in the exam.Thinking Beyond the Exam scenario-based questions challenge students to think critically about the role of the pharmacy technician in real-world environments.